Another pretty impressive sight in Panama is the Panama Canal. I have seen lots of photos and shows on the Canal over the years, but nothing prepares you experiencing the sheer size of this ode to human ingenuity in person. There is an expansion project of the canal in the works. Hard to imagine that the canal can now no longer fit some of the ships being built today. This particular ship had literally 2 feet of leeway on either side. Never bumped or nudged or even smoonched the sides. And I have trouble threading a needle on a good day. There are lots of tourist peoples visiting the Canal everyday. And I can understand why. I joined the throngs and ewwed and awed along with everyone else. You have to see the Canal for your self to fully appreciate her. That's really a cool photo. I'd like to see the canal one day. 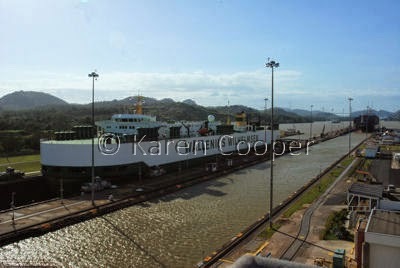 I have never crossed the Panama Canal yet. Hopefully someday I will. Thanks for sharing.